Erbium Resurfacing laser can be used to treat a variety of skin issues that require skin layers to be peeled away. • fine lines and wrinkles (skin becomes refreshed and a less sun damaged new layer of skin is revealed. • rhinophyma (shaves and refines enlarged nose associated with Rosacea). The Erbium Laser acts on the water in the skin to create focused heat and vaporisation. It also stimulates the production of collagen, creating a tightening and smoothing of the skin from the deeper layers. The Sciton Erbium laser is the first tunable laser – its depth of penetration and other Laser parameters can be adjusted for a customised approach. 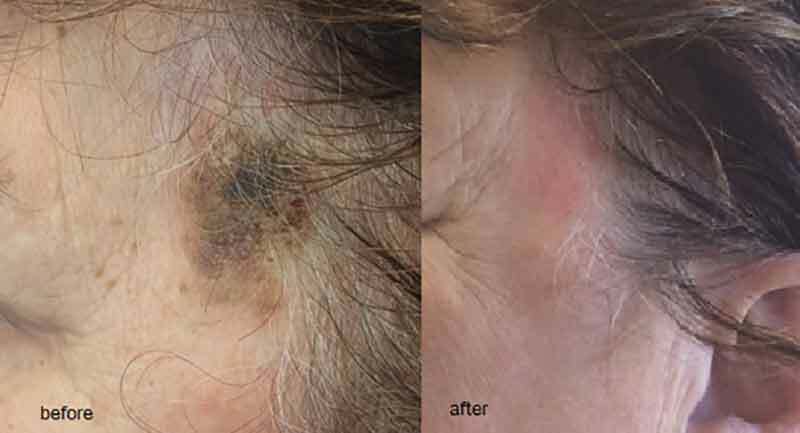 Compared to other resurfacing lasers (CO2 and YYGS), Erbium causes less persisting post treatment redness, and faster healing. Peeling the skin in very fine layers, is something that the Sciton Erbium Laser is exceptionally good for. The peels can be as fine as 10 microns deep (a Nanopeel), or more than 200 microns over heavily-lined areas of the face, like the upper lip. Laser beams can specifically peel off a spot from as small as 2mm across. The lighter the peel, the quicker the healing time. 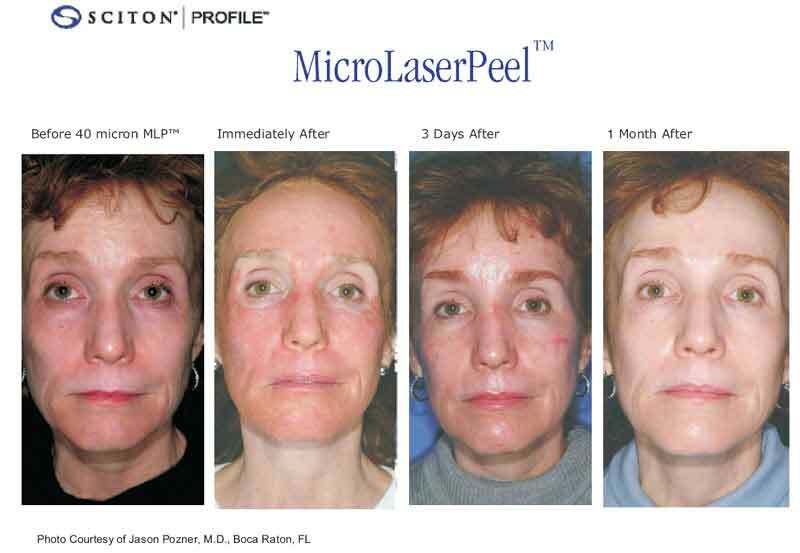 A MicroLaser Peel removes a thin layer of damaged skin to improve texture and provide uncover glowing healthier skin. It provides a superior result because is so precise in depth. The procedure will be tailored to your skin specifically. Depth of treatment can be altered for different areas of the face. It is possible to just treat local facial regions if required, like crows feet and around the mouth. Removing the top layer of skin eliminates some of the damaged cells that give skin a dull, tired look. As the skin heals, fresh cells grow and resurface the treated area. The result is more vibrant skin. It will improve mild wrinkles, scars, keratosis, sun damage and pigmentation irregularities. Most skin can be treated. Popular treatment areas are the face and neck, though some people also treat the décolletage and hands. How many treatments of MicroLaser Peel will I need? Excellent results can be obtained with just one treatment; however some situations may benefit from more sessions. Anesthetic cream will be applied prior to the treatment. This makes the treatment comfortable. This will of course vary with the depth of the peel and individual sensitivity. Immediately afterwards, your skin may be red or frosty colour. As the anesthetic cream wears off it will be somewhat stingy and feel warm. Over the next few days, the skin will feel dry and start to peel. You will be provided with products to care for your skin in this healing time, and you will have a follow up appointment to check on your healing. The speed of healing with depend on the depth of treatment. NanoLaser Peel is a perfect introduction to laser treatments for any patient interested in the newest way to get smoother, brighter skin. Forget about long appointments, 15 minutes is all you need. With just 2-4 days of some skin peeling, you can make an appointment on Friday, and let your skin recover over the weekend (well – perhaps a long weekend!) Then get back to work, play, commitments and compliments. Instant results, skin feels soft and super smooth. Makeup goes on easily. Complements Facial Injectable procedures if you get Botox or fillers to smooth wrinkles. Indulge in a NanoLaser Peel to restore a fresh glow to your entire face. Discover the benefits of laser resurfacing. NanoLaser Peel uses light energy to instantly remove the top layers of the skin at a depth that also accelerates the skin’s own renewal process by activating special messenger proteins. Only the NanoLaserPeel has the precision to work at just the right depth, creating beautifully smooth, luminous skin.